Couple of tactical decisions before the start, firstly to stay on the Mainland side down the Solent and secondly get some Westing in on the crossing in case the wind went round to the SW as we did not want to be beating into the finish. Start at Coronation and bit crowded at the buoy but away across the corner with Jo Jo Gunne outside us until they decided it was a bit shallow for them so we had to let them cross us but not sure why they tried to take us to windwood if they were unsure of the depth. First tactical decision paid off well as we single tacked down the Solent to the Needles on the mainland shore and those that went to the Island shore had to tack and ended up behind us. Once round Bridge at about 21:30 it was sheets eased out across the channel in a strong breeze and soon had to put a reef in followed by changing down to the No. 3. Quick crossing with one avoiding manoeuvre around a recalcitrant ship but the wind dropped off towards the finish so the reef came out and probably could have done with the No1. back up but the course was good and looked a lot better than those approaching the finish from the East. 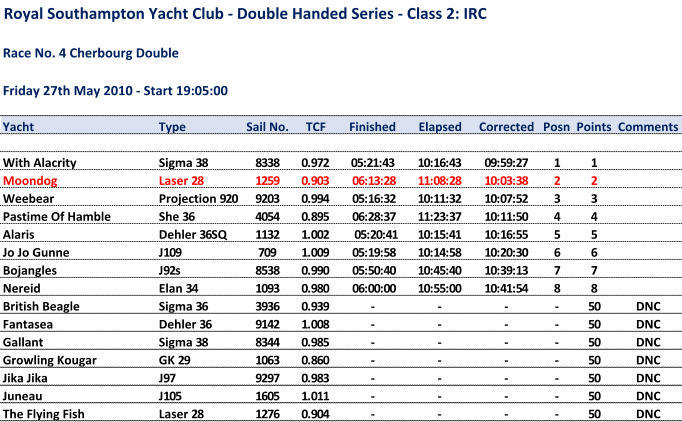 Finished just after six for a 11 hour crossing and 2nd overall on corrected to With Alacrity who probably had ideal conditions for their 2 handed rating but still good points for the Offshore series. Wind went round to the SW as forecast for a quick return trip which also took 11 hours even though we were cruising with two reefs and the No. 4.